SELLA CONTROLS has a dedicated team of specialist engineers and associated qualified partners, for onshore and offshore, both SCATS and OPITO certified, to provide technical support for any system we supply. We offer qualified and coordinated services tailored to individual customer requirements for all phases of the safety lifecycle. SELLA CONTROLS can provide your organisation with a number of cost-effective support services. SELLA CONTROLS uses bespoke CRM software to manage resources, repairs and schedule of works. We also manage our own database system for procurement, planning, engineering, safety validation, competence, commissioning and document control. This combination of management tools means that we can recommend to our clients a lifecycle plan from conception: scheduling standard maintenance requirements for resources and materials, planning for obsolescence of the existing legacy systems and managing modifications and upgrades as the assets mature. Safety planning starts by considering functions in several or all of the phases of the safety lifecycle and by having a company Functional Safety Plan in accordance with IEC 61508. The safety plan describes the organisational procedure of a project including safety-related functions throughout the entire plant lifecycle. It contains verification and validation plans and a review timetable. SELLA CONTROLS can assist with the design and implementation of this. SELLA CONTROLS will assist you in determining the required safety-instrumented functions (SIFs). Appropriate layers of protection will be identified to determine which safety integrity level (SIL) belongs to each SIF. The End User is responsible for producing a safety system requirements specification (SSRS) with detailed descriptions. The SSRS together with operation and maintenance procedures, will contribute to risk reduction objectives being achieved and identify the proof testing intervals required. SELLA CONTROLS can help you to visualise safety and control engineering concepts and functional specifications. 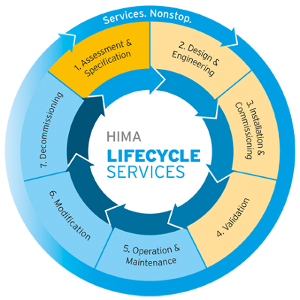 Certified engineers are responsible for engineering, programming and integration of HIMA systems – e.g. into DCS and asset management systems. Our considerable experience, intelligent interpretation of safety hardware typicals and preconfigured software modules ensures that your solution is implemented not just how you want it, but also safely, efficiently, on time and within budget. Our use of modern, standard engineering and project management tools is fundamental to this. SELLA CONTROLS can support you in assessing the Probability of Failure on Demand (PFD) of each SIF concerned, and therefore to fulfil all of the functional Safety requirements of the Safety Logic Solver. This includes detailed SIL verification reports. These reports also provide a firm foundation on which to build optimised maintenance strategies. SELLA CONTROLS will conduct a complete system configuration test using simulated field devices. This means that the system is only delivered to site once it’s been fully tested and accepted by you, our customers. SELLA CONTROLS experts can support installation of the safety system on site: professionally, efficiently and with specialist knowledge. This also means they are ready to verify any changes. Once your system has been delivered to site, engineers will assist at any stage of installation from loop testing to power up checks to a comprehensive Site Acceptance Test, as required. SELLA CONTROLS can help you to carefully install and commission all of the safety functions within the logic system. We ensure that all of the necessary information is provided at all of the operating interfaces. Our specialist knowledge expedites the entire commissioning process and provides a smooth, safe start-up phase. Subsequently, we will ensure that any necessary configuration changes identified on site are carried out in accordance with the safety plan and IEC 61508 in an efficient and timely manner. We will assist with the relevant functional tests during SAT to ensure that all of the safety functions work in accordance with project specifications. We can accompany you through the entire process and make all of our experience available to you. This site based assistance can extend to the site test run. Our objective is not only to maintain safe plant operation but also to avoid unnecessary plant downtime. To help you achieve this, SELLA CONTROLS can offer recommended spare parts for your systems. This stock may be held directly on site or, if preferred, can be included in a bonded stock agreement and held at SELLA CONTROLS until required. In the event of a reported fault, our experienced safety experts can assist to quickly identify the source of the fault. We can also support you in maintaining both the hardware and software of the HIMA safety system. Upon request, we can provide an activity report that may include functional safety review together with root cause data. We can help you develop and implement a tailored maintenance plan. We check, maintain, update and optimise the hardware and software within your HIMA system. The system maintenance also includes the revision of the system documentation. If desired, we can combine our visit with a brief system overview for your operating staff. Our Support Service and Helpline is designed to offer expert advice 24/7, 365 days per year, with regard to troubleshooting, hardware and software issues, modifications and understanding HIMA system diagnostics. Our 24-hour service (hotline, on-call and spare parts) aims to reduce or minimise the risk of failures and problematic situations. In certain cases, such as emergency and unplanned modifications, these valuable services can be extremely useful. Our experts are available to offer you practical assistance and advice around the clock, on services ranging from fault analysis, remote diagnosis, (if configured) and fault rectification, helping to minimise operational downtime. Where required we can arrange for an emergency engineer to be on site within 24 hours of your call utilising available local HIMA engineering support. Call Out is available 24/7, 365 days per year and applies to all principal industrial countries worldwide. We can offer clients the facility to hold core products in stock to meet critical response requirements and so minimise downtime and maximise cost-efficiency. We have a dedicated team on hand to carry out all non safety-critical related repairs at component level. Any TUV certified hardware will be returned to the Original Engineering Manufacturer (OEM) for repair. HIMA systems are specially designed to offer versatility throughout the modification process, to ensure they meet the demands of a modern process plant, with regard to safety and availability. Support with all aspects of decommissioning of system hardware can be provided, thereby ensuring safety of personnel, protection for the environment and conformance to current standards. On-site analysis is especially useful during decommissioning, removal or plant relocation. Utilising our extensive safety know-how we can work with your engineers to jointly develop practical solutions for decommissioning support.